We went into lockdown the other night. I added a second water reservoir to up my humidity levels. All was well. Eggs were wiggling and I was getting very excited for the big day. I woke the next morning and peeked into the incubator looking for more egg wiggles. Instead what I found stopped my heart. The temperature read 86°F and the eggs were sitting in about 3/4″ of water. It only took a moment before I realized that the water reservoir had sprung a leak. Quickly grabbing up eggs, I laid them out on a towel. I used up hundreds of paper towels (without a single care for the environment or cost) and soaked up all the water. I cranked up the heat to dry it out ASAP. When it got about right, I put the eggs back in. I thought it was a lost cause, but I still had a meager thread of hope. An hour later I peeked in to see where the levels were at and there was an egg, wiggling away. I literally cried with joy. Moments later another started. Before I knew it, they were all in there shimmying away. It was quite the emotional roller coaster. I am happy to announce that all fourteen are doing great now and there have been no more mishaps. I use a 75 watt standard bulb, but specialized heat bulbs are available. Make sure it’s something that allows for air exchange. Screen or wire is a good option. I like the trough style feeders, but they also have jar style feeders. I’m a fan of the mason jar style waterers like the one in and I like to put in glass stones to prevent drownings. I got one specifically for brooding that tells you what the temps need to be each week. I prefer paper towels on top of a beach towel for the first week because it’s cozy and they won’t ingest it, after that I use pine shavings or sand. 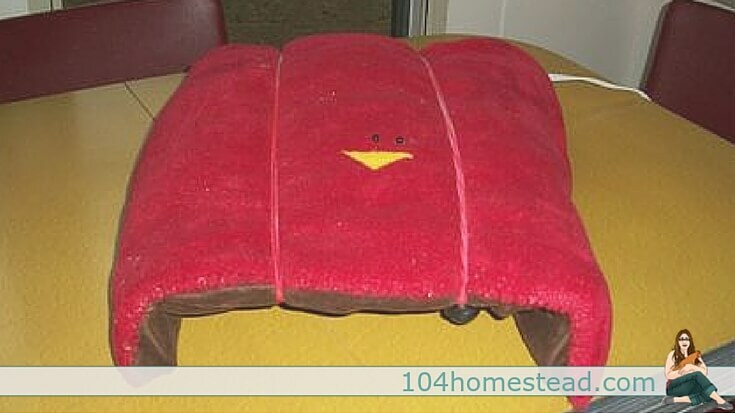 This alternative heat source was created by using a wire frame that can be customized to meet the chicks’ needs, a heating pad and a cute “hen” pillow. The creator of this design, BYC member Beekissed, is striving for a more natural approach to incubating and brooding chicks artificially. She seems like she’s having lots of success with this concept. You can find the post regarding this design at BackyardChickens.com, post #298. I have a very well reinforced support for my heat lamp and it’s fenced off in a way that the toddler can’t touch it. 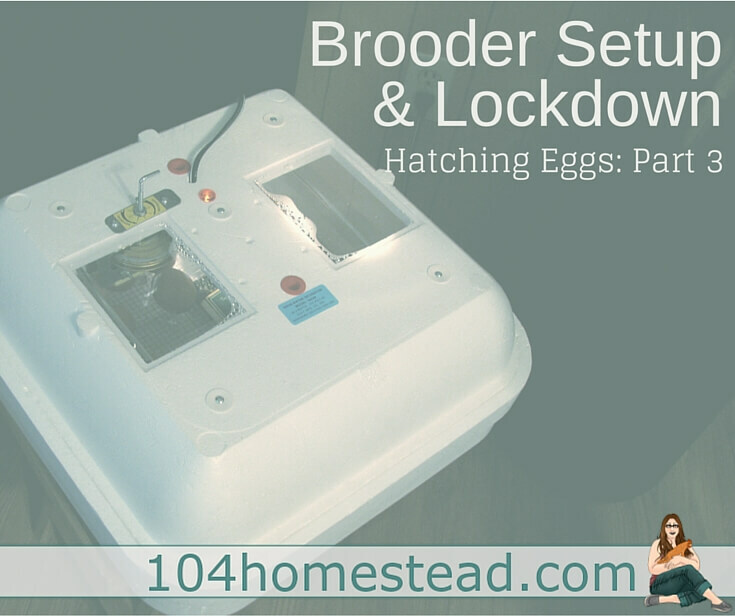 So, now that we’ve got our brooder all setup, we’ll get back to our lockdown. 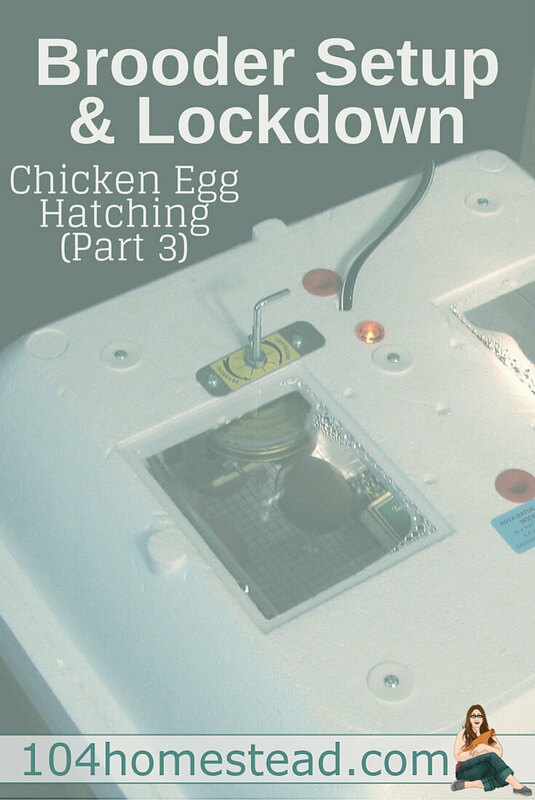 If you have an egg turner in your incubator (lucky you), then now it the time to remove it. Chicks are now getting into hatch position and turning them can cause malpositions. This is also the time to raise your humidity levels to 60-65%. Temperature should be lowered a bit down to 98º for still air and forced air incubators. As far as egg placement goes, everyone has their own technique. I like to lay them on their sides so they barely touch each other. I do this for two reasons. You get to enjoy seeing them wiggle all over the place. Not only is it thrilling to see, but it lets you know that all is well. I keep a little pad of paper next to the incubator where I mark who moved for the day. I am home all day so I can usually catch movement from everyone, which gives me peace of mind. Studies have shown that chicks can communicate to each other while in the egg. When they have contact, not only can they hear their neighbors, but they also feel their movements. Hatches can be synced by having the eggs barely touching. Another thing I like to do when putting the eggs into lockdown is that I position the lowest dip in the air cell so it is facing up. You can mark this area when you candle so it’s easy to identify at lockdown. Chicks will usually pip in that location, so having it up means that they will easily be able to get air when they externally pip. Have you dealt much with crossed beaked chickens? Of course my crossed beaked Lulu is my favorite chicken she loves to snuggle. But I worry if I’m doing everything right for her. 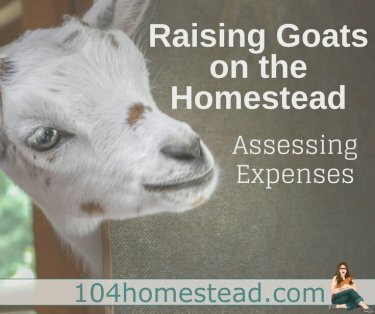 I have tried looking everywhere on how to take care of them and I find bits and pieces of good advice. I wondered if you might have any advice for me on that. Thanks for the great info I’m just learning this whole chicken thing and it’s great I’m trying to research everything I can. I really didn’t think I could get as close to my chickens as I have. They each have their own personality plus I spoil them. Thanks again. Thanks for the tutorial! I hope to do this one day 🙂 Thanks for linking up and sharing on Mostly Homemade Mondays! Love your blog… Waiting for hatching part 4! I do have 4 eggs right now under a broody hen and she is on her 20th day! So for know I just ordered chicks ducks and turkeys! They arrived this morning. Yay! I will be posting my blog on building a chicken brooder out of wooden shipping crates later today after I get the final pictures!! My husband buys me things all the time without knowing it lol. Keep me updated on your progress!